For 40 years, Malvern’s Dennis Nackord has unassumingly forged his legacy as a martial arts master on par with the world’s best. In these uncertain times, his message of self-empowerment is as relevant as ever. Every man has belts, but few have dozens of the sort hanging in Dennis Nackord’s closet. Black is the predominant color, but some of them are so worn that the beginner-white shows through. For Nackord, that proves how cyclical martial arts—and life in general—really are. Women tell Nackord that he looks like Omar Sharif with less hair, but he’s not buying it. At 6 feet tall and 210 pounds, he does have a low-key charisma, with piercing hazel eyes and a chiseled chin. He’s been dubbed the father of Philadelphia Kenpo Karate. Today, 90 percent of those in the region practicing Kenpo—often called “the mother art” because many others derive from it—descended from Nackord, though most don’t realize it. Kenpo provides a support system and structure for physical, mental and spiritual strength. The goal is not only physical training, but also the education of the individual. It’s a way of self-defense, self-discipline and self-knowledge. Regionally, Nackord is on par with West Philadelphia’s legendary Teruyuki Okazaki. A 10th-degree black belt and a native of Fukuoka, Japan, Okazaki has been far more guarded with his teaching. The common belief: Save your secrets, save your country. Through the overt exposure Bruce Lee brought, martial arts in America began to emerge in the 1960s and ’70s. Nackord surmises that Lee’s willingness to share, and profit from, the art may be why revenge was taken on him—that is, if you buy the conspiracy theories that swirl around his mysterious death at age 32. If you judge a man by the company he keeps, Nackord’s martial arts lineage is indisputable. He’s the highest-ranking student of Joe Lewis, who is to karate what Muhammad Ali is to boxing. Last August, the former two-time world heavyweight karate and kickboxing champion moved from Wilmington, N.C., to Chesterbrook and uses Nackord’s school in Wayne as his base. A 10th-degree black belt, Lewis won four U.S. Championships and three international championships. In 1983, he was chosen by his peers as “The Greatest Karate Fighter of All Time” in Karate Illustrated magazine. Nackord also aligns himself with Dr. Maung Gyi, who brought American kickboxing to the United States in 1963 and also founded the American Bando Association. Since 1970, Nackord has trained with Pennsylvania Boxing Hall of Fame trainer Marty Feldman of Broomall. His first serious martial arts mentor was the late Ed Parker, founder of American Kenpo Karate. Both Lewis and Gyi were on hand last September to promote Nackord to the rank of ninth-degree black belt, the first in the 40-year history of the Joe Lewis Fighting System. At issue these days is the direction the discipline is taking. In February, the Pennsylvania State Athletic Commission followed the lead of other states and approved bouts in Mixed Martial Arts—or extreme fighting. The state anticipates regulating four to five events per month to generate $80,000 per year in revenue. In sports, there are rules. But if you’re in a fight for your life, there are no rules. Survival, too, is an art. In the end, this is a story about the men trying to preserve the “art” in martial arts while defending the dignity of their own careers. Dennis Nackord was raised on the San Francisco Bay peninsula. His grandfather was a city councilman and mayor of San Carlos, but most of his family was in the building trades—including his father. He studied architecture before his life changed course. At 20, Nackord began taking classes at a local karate studio. By 1966, he was working there. 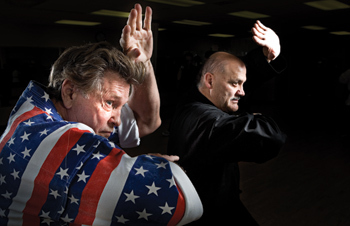 Three years later, he moved to Philadelphia to expand Tracy’s Karate, a system that still exists—though it’s a mere shell of what it was in the early 1970s. The first East Coast Tracy’s was on Cottman Avenue off Roosevelt Boulevard in Northeast Philadelphia. It’s still a karate studio today—one franchised to American Karate Studios, a corporation Nackord formed and ran until 1980. One American Karate location is run by Mark Schiffman, a student Nackord promoted from a fifth- to seventh-degree black belt in January. Schiffman first met Nackord in 1975. After completing an introductory course, his parents couldn’t afford additional lessons, so he negotiated a deal with Nackord. Since he was working at a local gas station, he figured he could afford to pay $10 a week. Nackord asked if he could rake leaves. Schiffman said he could and recalculated what he’d pay per week. After the initial course, Schiffman never paid for lessons again. In 1983, he became a black belt. From 1986 to 1993, he was ranked among the top 10 in the country in his division of the United States Karate Federation. He bought his own school in 1987. Twenty-three years later, in 2007, Nackord moved to Gateway Shopping Center. Tenth is the highest black belt, but Nackord says almost every rank is too high, including his own. “It only exists because of the structure,” he explains. Nackord doesn’t need vacations away from his Malvern home, but he takes them with his wife, Lorraine, a retired pediatric nurse. They have four children—Amy, Jessica, Elizabeth and Jason (a brown belt)— and six grandchildren. With his family and at work, Nackord prefers not to over-manage. He’s a facilitator and a counselor, favoring dialogue over threatening consequences. This even holds true in the after-school program he began last fall for students at the neighboring Valley Forge Elementary School. The five-day program includes transportation, a homework period, time for a snack and rest, and a karate and exercise period. An unwavering truth Nackord feels compelled to dispense is that traditional martial arts are not violent. Initially, the goal is the external control of an opponent. Then comes the physical and emotional well-being of one’s self. Under the Nackord system, internal Eastern philosophies flourish. One, “The Way of Three,” stresses health, harmony and haven. Exercises focus on breathing, stretching the body, strengthening the joints and spine (“where all energy comes from”), and calming the mind. His teaching describes the evolution of movement through another three-part system he calls MotionScience. The first level describes form; the second gives the form movement and effectiveness; the third level teaches strategies. All Nackord Karate System classes are taught by high-ranking adult black belts. With 250 students, Nackord has a 20-year manager in John Von Cleve, and 10 instructors teach as part of their own training. Sixty percent of his clients are adults, some in their 70s. A quarter are women. 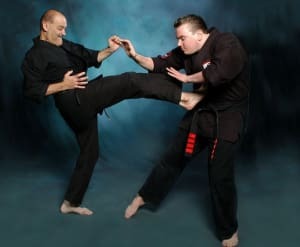 He offers a corporate training program in which participants learn centuries-old wellness routines proven to fortify the body, plus fundamental martial arts techniques to build character and hone self-defense skills. Most karate schools enroll about 90 percent children. And while NKS does offer classes for kids, Nackord has always attracted a more mature audience. At one time, when parents signed up their children, he offered free lessons for the adults. Now, like a well-run law firm, Nackord’s instructors bring in their own business year after year.